In recent years, as many of my girlfriends hover in their late 30s to late 40s, I’ve had a handful that have decided to do parenthood on their own. I commend them. No more waiting or wishing for Mr. Right, no more hoping for Prince Charming or a knight in shining armor, no more sacrificing what they really desire for the sake of making another happy. They became a parent on their own, alone, and consciously. Don’t get me wrong. A fantastic partner would have been ideal. Nobody can deny the fact that it takes a village let alone another human being to help raise a child. However, that opportunity never presented itself to these women at the right place, time, or situation. So, like strong women do in many situations, they decided to go it alone. Maybe you take vitamins. Maybe you do not. Or, perhaps, like myself, you diligently take your multivitamin regiment since you are fully aware you do not eat all the fresh veggies and protein you need daily. Maybe nutritional testing is a good idea. But here is the question… are you absorbing those nutrients? Are those the right nutrients for your body, genetic make-up, or lifestyle? After all, we are all metabolically unique. 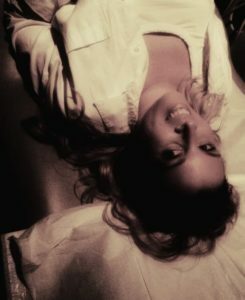 How do we know if what is right for me is right for you? 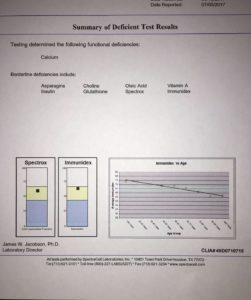 My big shocker came the day I received my own nutrient test results. I had been spending top dollar on a legitimate all-encompassing liquid vitamin. (I should have been clued in when everyone else felt great on it but me. I still felt tired). My test results came back. I was still severely low in most of my B vitamins. The company isolated a genetic factor called MTHFR that explained why my body wasn’t utilizing the B vitamins I was taking. Lesson learned!!! I immediately switched to a form that was bioavailable for my body’s genetic constitution. My energy levels increased. I felt great. Let’s fast forward two years. I am a cancer “survivor” (I still do not like this label). I know I should not be consuming dairy. But I am eating it; in all forms. I fantasize about yogurt, sour cream, and cheese. A few slices of goat cheese could constitute a meal. “Why?” I wondered. I was never a dairy lover before. Once again, I decided to contact Spectra Cell laboratories to find out what was going on. Were my new multivitamins paying off? Was I missing something? This summer I have decided turn eating simply into an art. I’ve decided to eat for myself, shop locally at the farmer’s market, and try to listen to my bodies cravings. “Why?” you may ask. Because I wasn’t feeling good, appeared swollen (in all the wrong places) and I had low energy. I found myself eating from a place of social obligation, but still felt hungry. I knew my body must not be getting what it needs. This means that all the fancy cookbooks on my shelf are on a vacation. 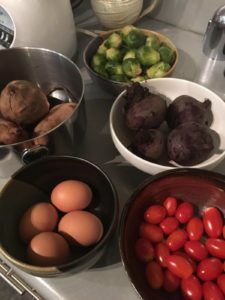 This summer I’m eating what looks, smells and tastes good to me intuitively. Our body needs basic raw materials to provide proper cellular activity for survival. Everyday I watch animals instinctively selecting the fresh buds from trees to eat. Imagine how much cellular energy the are getting from that little sprig or leaf! The deer, rabbits, and squirrels, do not seem to suffer from lethargy, fatigue, brain fog, inflammation, infertility, or emotional eating. They seem (from my unprofessional observation) to feel pretty good.